Stillman students in Larry McCarthy’s sport marketing class collaborate with FOX Sports to define “The Seton Hall Way” in a new marketing campaign for the BIG EAST. Here’s a daunting piece of class homework: Define Seton Hall’s essence in a phrase. That was the ambitious assignment FOX Sports gave a sport marketing class at the Stillman School of Business in January as part of a marketing initiative for the BIG EAST conference. Larry McCarthy — an associate professor who teaches in the sport management program and whose students routinely work in marketing internships at such area teams as the Yankees, Mets, Nets, Knicks and Devils — divided his class into six groups of five to develop proposals for “the BIG EAST Way,” a campaign spotlighting the attributes of member schools. 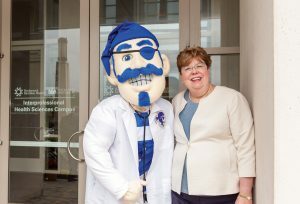 So what does make Seton Hall unique? From a marketing perspective, “our secret sauce seems to be community,” says McCarthy. But how do you put that into a catchy and memorable tagline? Brown and his fellow team members spread out across campus to conduct surveys of nearly 100 students involved in everything from sports and fraternity life to student government and ROTC. 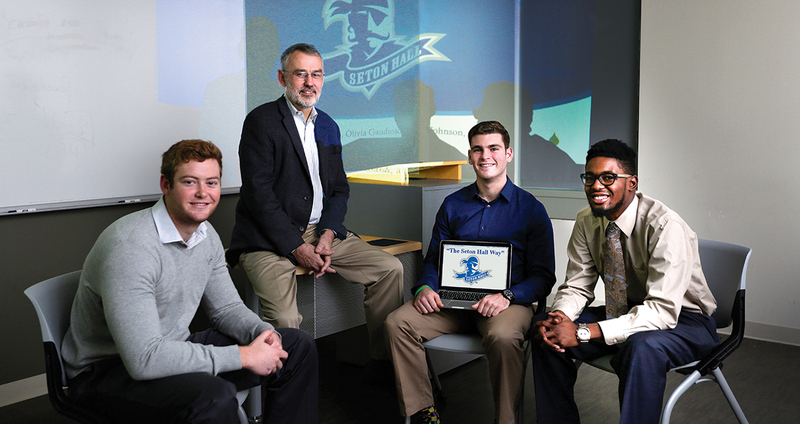 Along with Stillman students Olivia Gaudioso, Nate Johnson, Steven Lombardi and Andrew Whiteman, Brown discovered that small size and a strong sense of community were the top Seton Hall attributes students valued. Others were the concept of “servant leaders” and the commitment to community service. Creative control has now transferred over to FOX and the BIG EAST as they craft the final messaging that will appear in a variety of media platforms, such as the BIG EAST Hoops e-newsletter and other digital and social-media outlets. This next phase of the project will include yet another learning process, says Kaitlyn Beale, manager for marketing and strategic partnerships at FOX Sports. She says that while the team’s idea of a small school with a big personality is “cohesive and on target,” the campaign will undergo a translation process — as all do — as it comes to life. 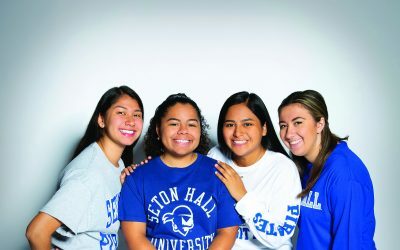 “When the production team begins to execute it,” she explains, “things change.” Brown and his fellow students got to observe how this works, Beale says, as FOX captured footage during this fall’s Seton Hall Weekend. Which brings us back to Professor McCarthy, who started his career as a physical education teacher in Ireland, and came to America to get a master’s degree. He eventually received his Ph.D. in sport management at Ohio State University, and now works in the management department at Stillman, which supports 120 undergraduates majoring in sport management and sport marketing. What McCarthy teaches is both theoretical and practical. For example, students in his classes have worked with the New York Red Bulls soccer team by trying to sell tickets over the phone at a call center. “Calling John Q. Citizen is a great way to learn how to sell and gain confidence,” he explains. Bob Gilbert is a writer based in Connecticut.